de Jong: Dutch: from the epithet de jong “the young”, used as a means of distinguishing between two bearers of the same personal name, usually a son from his father. 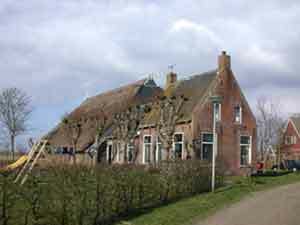 In the 1830’s this was Menne Ydes de Jong’s farmhouse in Lichtaard, Friesland, Netherlands. Menne Ydes was my 3rd great grandfather. Lichtaard is about 10-15 miles from the North Sea. This is a traditional Friesian farm house. It is all one building. The barn is in the back with the living quarters in the front. Hans Mennes de Jong was born and raised here. Hans Mennes immigrated to the United States and settled in Grand Rapids, Michigan in 1882. The de Jong family hails from the province of Friesland in northern part of the Netherlands. Friesland is a beautiful agricultural area that is adjacent to the North Sea. Over generations, the deJong family resided in towns along the dike. My Dutch relatives can trace the family back to Iede Jans about 1650. They were basically farmers by trade. 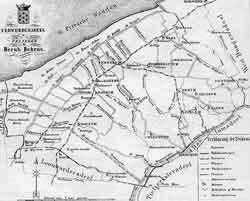 Below is a map of Ferwerderadeel, the province of Friesland my ancestors came from. Blija, Ferwerd Hogebeintum, Hallum, Marrum, Wanswerd, Genum, Janum, Jelsum, Lichtaard, Reitsum and Birdaard are some of the towns they lived in. In the early 1800’s The Netherlands was occupied by France. On August 18,1811 Napoleon Bonaparte signed an Imperial Decree Number 7178 in the Saint Cloud Palace, of which the first article states that people living in (different parts of) The Netherlands were obliged to pick a last name. Article 5 of this decree stated that people who already had a last name were obliged to Register that name. Most of our Frisian ancestors had not adopted a last name until then. It was Yede Jans who chose the name the last name de Jong. de Jong means the younger. In this case, the younger Yede. Yede Jans was Iede Jans’ great great grandson. Hans Mennes de Jong, my third great grandfather married Antje Beernts Krol in 1859. They had three children: Minne, Berend, and Hiltje. The second period of substantial emigration from the Netherlands to the United States started in 1880 and had to do with the fact that cheap grain was imported on a large scale from …. North America! Because of this the agricultural areas in the Netherlands, and elsewhere, encountered hard times with a lot of unemployment and poor living conditions which made many laborers and farmhands decide to immigrate to a better life in America. During 1880 – 1893 tens of thousands departed for the “New World” from both Antwerp as Rotterdam. Whether it was these economic conditions or poor management, Hans couldn’t make it as a farmer in Friesland. 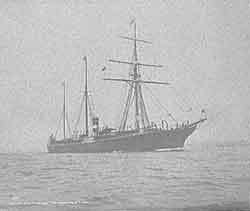 In 1882 he borrowed 6,000 guilders from his father and he and his family left for America – Minne and Berend on the Amsterdam in March, 1882 and Hans, Antje and Hiltje the following month on the P. Caland. They arrived in New York and went straight to Grand Rapids, Michigan. I think they went to Grand Rapids because Han’s uncle on his mother’s side – Roelof Kroodsma – had a dairy farm outside the city. The de Jong’s settled in the city and went to work in the furniture factories. I don’t know much about their life there. Hans and Anna lived in Grand Rapids until they died. Antje (Krol) de Jong died in 1911 and Hans Menno de Jong died in 1922. They are buried in the Garfield Park Cemetery. Their children Berend and Helen stayed in Grand Rapids. My Great Grandfather Minne (Harry) immigrated to the State of Washington about 1898 with his family. They were following his wife’s brother Peter Dijkstra>Dykstra who had moved here several years earlier and started a dairy farm.